This past week we had went to Utah for Hailey's Rehab Doctor appointment. We go to Utah because there is not a pediatric rehab doctor in Las Vegas. The Rehab doctor manages Hailey's Baclofen medication and she is the one that would administrate Botox in Hailey's calves if needed. When we go we are traveling out of state, and staying in a hotel. Our insurance doesn't help with this cost. Hailey hasn't needed botox in over a year but she has needed Baclofen. Baclofen is used for treating spasm of skeletal muscles, muscle clonus, rigidity, and pain caused by disorders such as multiple sclerosis or Leukodystrophy. It is also injected into the spinal cord (intrathecal) for management of severe spasticity. This doctor also manages Hailey's AFO's (Ankle Foot Orthotics) In the past we did try to have her AFO's done in Las Vegas and they were done incorrectly EVERY SINGLE TIME! That was unacceptable so the Rehab Doctor handles that as well as the physical therapist in Utah. The last pair of AFO's ended up stretching at the block (the block helps Hailey to NOT hyper extend her leg) this was the 2nd pair that did this. We finally picked up a pair that will help this to not happen again...hopefully. At the appointment the Rehab Doctor was very impressed to see Hailey doing SO well. Again she took a video to show the neurologist in Salt Lake. I finally had spoken up to let her know that I feel as if the Neurologist in Salt Lake has lost interest in Hailey and her case. I feel as if he is telling me, Your child has a terminal disease, nothing you can do, have a nice rest of your life. Of course he has never said those words to me this is just how I am feeling. I do want her to report what I say to him. I don't feel as if he has listened to my concerns or questions. 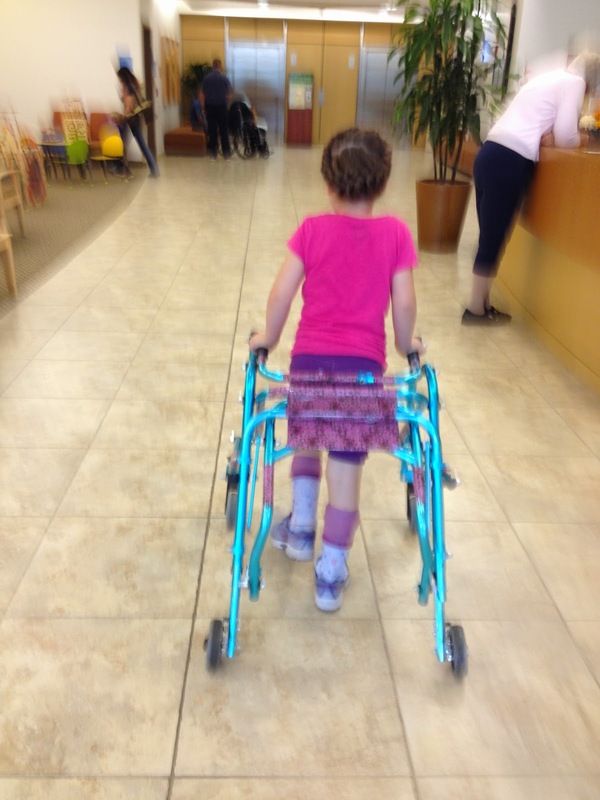 When the doctor and the physical therapist put Hailey's new AFO's on you could really see the difference in her walk. Right now, until she gets used to it, her walking is a little unlevel and she has a very wide gate to be balanced. When she uses her walker she does a lot better. When she walks without her AFO's and without her walker she is VERY unsteady, has a very wide gait, and I feel as if I'm playing catch. She doesn't stay upright for very long without them. These are a very necessary piece of medical equipment. During the appointment the doctor really stretches and sees what Hailey's range of motion is. I remember the first time we had went to this appointment and Hailey was SO stiff and she would scream and I hated watching her struggle. Today is so different from 2 years ago. Hailey's range has improved so much. Hailey works so hard in physical therapy and when she goes to horse therapy. We can see a difference. You can't go to the doctor without getting a prize, but this time I had a VERY special prize for Hailey. Hailey loves My Little Pony and she loves blind bags. Something about not know which pony you're going to get is very thrilling to Hailey. There are toys called Fash'ems. For the most part you can purchase these at a store called Justice, but our store NEVER has these available and when they do they are $5 each when they are on sale! I happen to have 2 Fash'em capsules in my purse just for Hailey. When I gave them to her for being a good patient the smile on her face was priceless! Hailey: Hi I'm Hailey, This is my mom, mom. Mom, say hi! Hailey: This is my Josh. Josh is a boy. Josh say hi! She is our social coordinator. I love that she makes friends wherever she goes. You can be 8 months old, 8 years old, or 80 years old. Hailey's going to befriend you. The backdrop to the show is AMAZING. You are placed in a mountain. 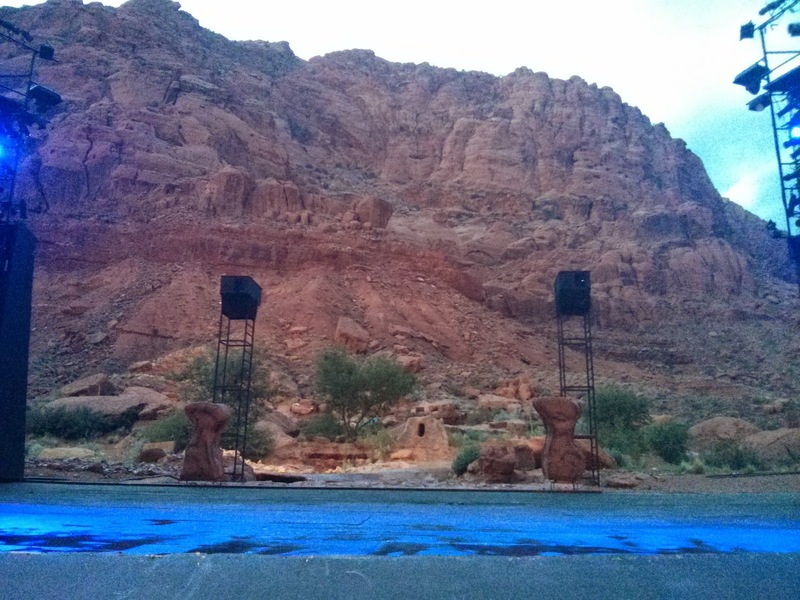 Right before the show starts the stage FILLS WITH WATER!! Yes! Fills with water! The music starts and then Ariel pops up. Hailey is frantically waving and is smiling ear to ear! Due to inclement weather the show was cancelled. I was SO bummed. Hailey just thought the show was over. We were soaked! One of the people sitting next to us was an instant friend of Hailey's! She is a teacher for special needs children in California and came down with her parents to see the show. It was great meeting her and her family!! So we got in the car and drove to the hotel so we could dry off and get to bed. Overall the appointment went great. I'm very glad we finally got Hailey's AFO's correct! I'm bummed about the play and I'm waiting to hear about what our options are going to be. Hopefully we get to see the show in it's entirety but if we don't I know Hailey was content in what she did see. She really loved the music and the characters! Next time we go we will have to also see Hailey's cardiologist as well as the rehab doctor. The cardiologist ALWAYS makes me so nervous. She is the one person that has not had great news to report back to us. Hailey will need another holter monitor and EKG. She's not going to be a happy camper. I better make sure I can get my hands on a few more Fash'em capsules!